The city center of Rome is packed with terrible restaurants of varying quality. I’ve got a few favorites (Roscioli, L’Asino D’Oro, Il Pagliaccio), but, in general, I do most of my dining outside the center of town. I have a bike so it’s easy to get around, but visitors to Rome can count on relatively straight forward public trasport to get them to other areas. Pigneto is particularly accessible, just 7 stops (20 minutes) on the 5 or 14 tram from Termini. Mesob: My absolute favorite place to eat in Pigneto. This Ethiopian restaurant is just under a year old and serves impressive vegetarian dishes. The injera is outstanding. You can read the full review here. Mesob is located at Via Prenestina 118. Birra Piu’: My second favorite spot in Pigneto is this beer shop. Shelves and a couple of fridges display craft beers from Italy, Belgium, America, and the UK. You can take bottles to go or drink in front of the shop from plastic cups. Birra Piu’ is located at Via dei Pigneto 105. Il Capriccio di Carla: Carla D’Ambrosio serves all-natural artisanal gelato made from meticulously selected ingredients. The pistacchio, almond, and hazelnut are fantastic. Carla also makes a mean tiramisu’. The shop is located at Piazzale Prenestino 30/31. I Porchettoni: An Ariccia-style fraschetta serving super cheap antipasti, primi and secondi. The atmosphere is fun and animated. Expect some shouting. More here. I Porchettoni is located at Via del Pignetto 68. Necci dal 1924: Necci’s got it all. It’s a bakery, cafe, restaurant and bar open 7 days a week. It doesn’t serve the best food on the planet but it’s a nice spot for a drink and a snack on the patio. Necci is located at Via Fanfulla da Lodi 68. Gelateria del Pigneto: Just off the isola, this gelateria was recently recommended to me by a reader. It serves mainly natural flavors–others have synthetic coloring; ask at the counter for specifics. 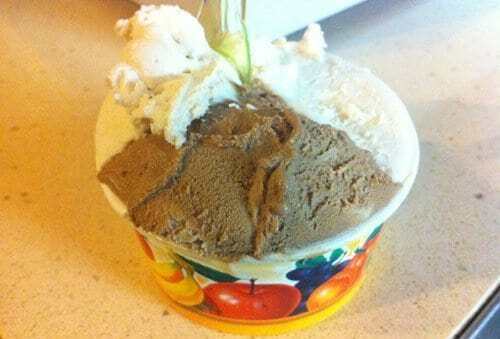 The gelateria is located at Via Pesaro 11. Of course not everything in Pigneto is great. The most famous restaurant there, Primo al Pigneto, wins my imaginary award for worst service in Rome. It’s one of those see-and-be-seen joints so no one seems to notice how absolutely boring and poorly executed the food is. So that’s my round-up. There’s plenty I didn’t cover here. What are your favorites? The Necci 1924 can be nice but it helps to go early in the evening. Later on, if you only want to drink, you get pushed around. They say they are more a restaurant than a bar; even so, customer care is sometimes wanting. Props for the Pigneto write up! Tried Mesob for the first time last night, and it might be my new favorite neighborhood place. Been to Necci a few times, and I think it is overpriced, greasy trattoria food, bad service, and a nauseating scene. However, the cornetti are the best I’ve ever had. Primo is good, but yes, the service is deplorable. I’ll be on the lookout for more interesting places to eat, but I must say, I’ve been pretty disappointed with most of the new “trendy” places that have been springing up. However, the “trattorie di una volta” in the part of Pigneto more towards Largo Preneste are a safe bet. For cheap and delicious pizza by Pizza Vulcano (€3.50 pizza margherita). It opened about 6 months ago is open late night and is always packed. A tiny hole in the wall with just a few tables. It’s on via del Pigneto, but on the other side of the bridge, just a few doors down from Tandoori Tiger. Then there’s a great pasticceria that has awesome cornetti and is always open, even late night, on the corner of via Prenestina and via Fanfulla da Lodi. “Ciak Si Mangia”, very near the Necci, is honestly priced, with good if occasionally eccentric service. Everything is on a movie theme, with pizze named after famous movies, and a fine photo of Anna Magnani on the wall. Further down the Via del Pigneto going south: the “Qui Si Magnà”: very simple home cooking. It’s advisable to book on Fridays, weekends. When I get a precise address and phone # I will post them here. Necci is great for breakfast/brunch/midweek lunch, and the terrace is great, but as soon as it gets busy food quality and service are seriously variable. We love Pigneto41 (on the isola pedonale at number 41…) good food, constantly changing seasonal specials are a good bet, as is the carbonara, and service is friendly tho’ maybe can suffer a little when very busy. I actually like Primo, have always had great service there, helpful wine suggestions etc. I agree that the food isn’t perhaps as amazing as they may make out but it’s well executed, very agreeable, and in the end costs the same as a less good supper at Necci. Just avoid weekends when it’s full of poseurs on daddy’s dime. I LOVE Birra+ (for takeaway, despite being English I like my beer sitting down and with something to eat…), Cargo has good beer on tap and seats, but gets very busy. Also love Mesob! Good (for the area) and well priced wine selection (to take away, though they do have a couple of slightly sad tables in the back) at the enoteca on via Macerata (via l’Aquila end) deserves a mention, also for the mozzarella di bufala delivered twice weekly (Tues and Fri), and fab ‘nduja, and because they’re so nice. Also the ex-pasticceria on via del Pigneto, just across via Macerata from Birra+, does a very passable pizza. I normally avoid Indian restaurants in Rome, even though I love Indian food, so I was really pleasantly surprised finding Tiger Tandoori in Pigneto, really fun, easy going, delicious food and it has Stella on tap – what more could you ask for . Now, if anyone can recommend a good Thai restaurant, I would be very grateful! thanks for all the reccos, folks! looks like ill have to delve into another dozen spots or so and do a proper revision soon. cheers! @nick there may not be any good thai places in rome. thai inn is insanely bad and salathai used to be pretty good but i went south a few years ago and i havent been back (so maybe things have changed?) . actually, gothai is alright. nothing amazing but it wins by default. I’m an American living in the heart of Pigneto (on via nicolo picconino) for about two months now. In the states, I grew up in Las Vegas, went to school in California, and have been living in Boston for the past 10 years. 1. The original post is absolutely correct about Primo: the food is good but overpriced, and the service is horrific. I wouldn’t damn Necci as harshly, but to me it’s generally in the same category of not living up to the hype. I am an American living in Pigneto for over a year now. I would definitely recommend Pizzeria Vulcano. One of my absolute favorite pizzas in rome, and the suppli are delicious as well. Give it a try!